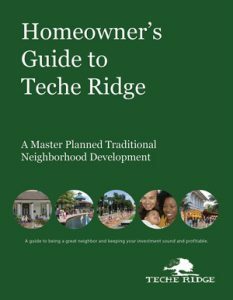 This guide outlines the community processes and organizations used in creating Teche Ridge. We have highlighted the most important elements to consider when deciding to live in a master planned community and list where to look for help when needed. Teche Ridge is built on Smart Growth principles which have already shown great success in development planning, and have been useful in helping to obtain desired benefits of community planning. “Teche Ridge’s regulations, Covenants, Associations, and codes” work together to create a functioning community.